There are many economic factors that influence why it can be hard to find a job for millions of talented and experienced workers. When the economy is in a slump, jobs are not plentiful. People are laid off for various reasons, including company downsizing or because their employer is facing financial problems and can no longer afford to maintain the staff. When more and more people are laid off, more and more people, naturally, start looking for jobs. In addition to there being fewer job openings, your resume may be lost or overlooked in a deep pile of thousands of applications and resumes for the same job. It is indeed discouraging. If a person is lucky enough to find a job, but not a job that is comparable to his previous one in terms of income or skills required he is considered underemployed. This is why is not only hard to find a job, but to find a good job. This is a measure of labor and employment utilization in the economy and how well the labor force is utilized in regard to experience, skills and availability to work. When workers are quite skilled but are employed in low skill jobs or when a person is working part-time but wants full time work this is considered underemployed. The underemployed person is working but he isn't working at his full capacity. A good example would be a college professor working as a clerk in a retail store. This person is under utilized by the country's economy because, in theory, he could better benefit the overall economy if he were working as a professor. When times are tough and people want and need work but can't find it, the result is discouraged workers, which are those who are unemployed andcapable of working but haven't tried to find a job in the past month. These are the people who are frustrated and overwhelmed because they haven't succeeded in finding a job and basically start to give up. When a person ultimately gives up looking and doesn't continue the job hunt, he or she is no longer factored into the unemployment rate because they are not earmarked as a part of active labor force. It's tough to find a job in a weak economy. 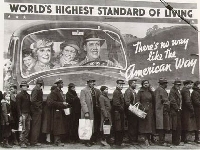 In fact, it's taking, on average, approximately eight months for people to find a job in the United States in 2011. There are far too many Americans that can't find a full-time job even after looking for more than 12 months. Approximately 19.3 percent of the workforce is either underemployed or unemployed, notes Gallup. If you find yourself in one of these positions take some comfort in knowing that you aren't alone. You are a victim of a poor economy just as millions of others are. Of course, that doesn't put food on your table or gas in your vehicle so it's small consolation. It is a stressful time for many people. The United States needs to produce 150,000 new jobs each month to keep up with the population growth of the country but only approximately 36,000 jobs were added in January 2011. The country is lagging behind its job market needs. Many jobs are being outsourced because the labor force works far cheaper in other countries than it does in America. Furthermore, advances in technology have eliminated the need for humans. Their jobs can now be done by computers. In August of 2011, the economic confidence of the United States dipped dramatically, which hasn't been experienced since March of 2009, when there was a recession and economic confidence was at an extremely low point. The factors that create an economy where it is hard to find work are many and complicated. Job seekers need to add new skills, search more diligently and access every resource they have to find employment during a recession.